Providing maximum throughput for high bandwidth connecitivity for demanding IT and media and entertainment applications. 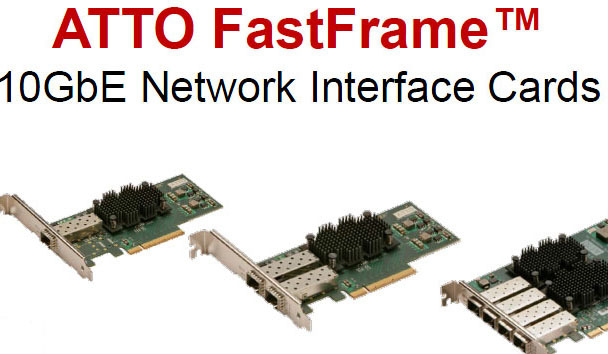 ATTO FastFrame 10GbE Network Interface Cards are a family of Quad, Dual and Single port, PCIe 2.0 x8, 10Gb Ethernet Adapters offering industry leading I/O connectivity for low latency, high bandwidth and highperformance networking applications. FastFrame 10GbE Network Interface Cards are built on an industry standard, Ethernet technology offering highest throughput for critical data center applications. The FastFrame NS14, NS12 and NS11 simplify networking administration, integrate seamlessly into existing environments and reduce the total cost of ownership by improving connection bandwidth and eliminating redundant network infrastructure components. By leveraging Data Center Bridging and support for software iSCSI initiators FastFrame network adapters offer the ability to support both local and storage area networks. The FastFrame NICs provide industry-leading throughput and latency management with minimal CPU utilization and power consumption. Leveraging ATTO’s expertise in verticals such as Media & Entertainment, Government, Education and Medical Imaging, FastFrame deliver a solution that fits everyone’s needs.